Speaking of the holidays, make sure you go and check out the first post on this year's gift guide series! It's the Gift Guide For Her For All Budgets and I've gathered so many fun items that any lady in your life will LOVE! I'll be posting a new gift guide each Saturday until the week before Christmas! Well, minus the weekend of Thanksgiving, because that's family time! Plus, you'll all be too busy shopping those Black Friday weekend sales, right? Anyhoo, today I just wanted to share with y'all some things I've been absolutely loving lately! I used the new poll feature on my Instagram stories to see what you all wanted to see on the blog, and this post won by a landslide! I'll definitely be using that feature more often to get your opinion, I really like getting input on what YOU like to see on the blog, and this is such a simple way to do it!I share a lot of things that I love here and on my Insta, but sometimes it's nice to share a few more details on some recent items that don't always come together in one cohesive post. Plus, these types of posts generally end up with me giving y'all a little bit of a life update as well which I personally love reading on other people's blogs! Now for those things I'm loving! I am obsessed obsessed obsessed with this palette. 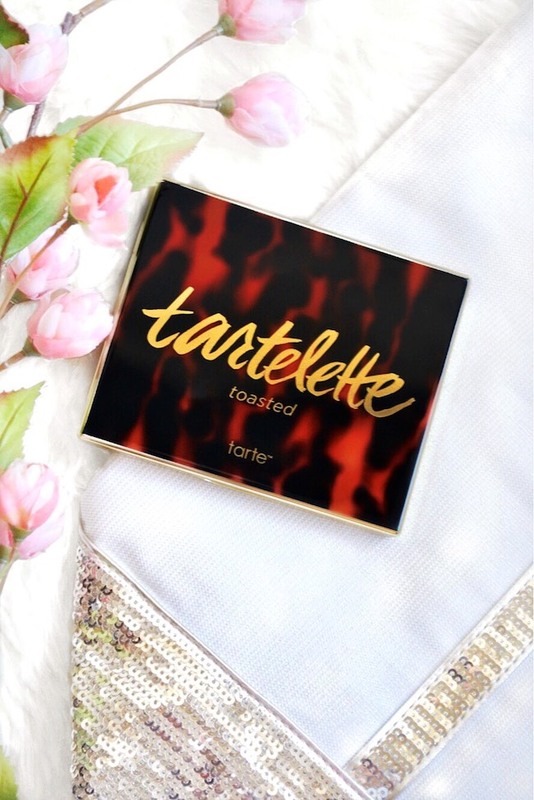 The Tarte Tartelette Toasted Eyeshadow Palette has 12 gorgeous shades that are not only super pigmented, but also so soft and blend-able. 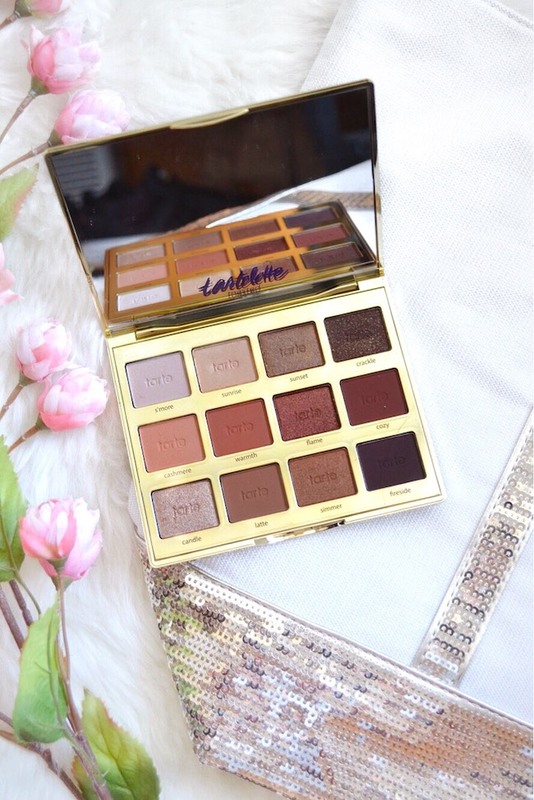 Tarte is one of my favorite beauty brands (you may remember me talking about their Rainforest of the Sea Palette in this post!) and this new palette from them definitely didn't disappoint. I would have swatched the shadows, however as you might be able to tell from the not-so-great quality of the photos above, I was losing my light! So I think I'll be swatching them sometime soon on my Instagram stories instead. I've also got a few other fun things from Tarte that I'll be sharing soon on here as well as in my Beauty Gift Guide coming this weekend, but wanted to include these eyeshadows first just in case you're in need of a great palette before then! Oh my gosh this candle is quite literally what heaven smells like. I love it so much that I contemplated buying two of them just in case I burned through one too quickly! If you love the smell of chocolate, more specifically the smell of fresh brownies baking in the oven, then THIS IS THE CANDLE FOR YOU! I'm a candle lover, but I've never loved a candle as much as I love this one. I guarantee this will be the one fall purchase that will become routine for you now that you're aware of it! 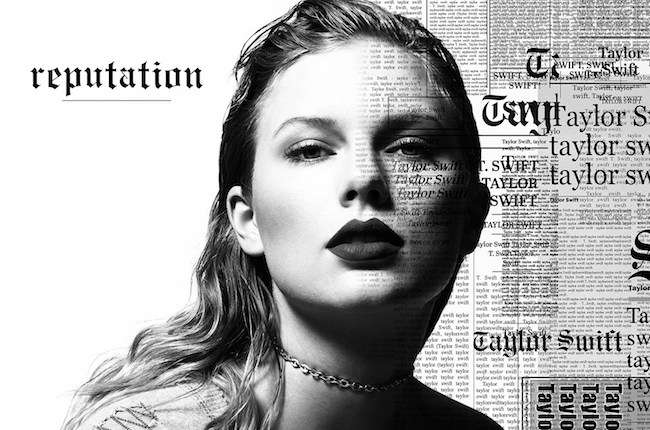 Okay I know Taylor Swift is all kinds of controversial these days, but I have to say I have really been getting into her new album. It's so different from her other ones, and I LOVE how she is kind of leaning in to all the rumors and all the drama from the last few years. Now I'm not in love with all the songs, however most of the album is great! My favorite song at the moment is I Did Something Bad. It's so fun and catchy, and I can't stop listening to it! Honorable mention that almost took this slot was Niall Horan's Flicker, but since Taylor's album was more recent I chose hers! Flicker is seriously amazing though, and if you haven't given it a listen I highly suggest it. My favorite song from him is Paper Houses! I LOVE THIS ARTICLE. For those of you that blog, especially as a full-time job, this article is probably everything you've had to explain to someone who asked you what you do for a living. For those of you who read blogs, this is also such an amazing article that gives you SO MUCH INSIGHT on what it means to work as a blogger. Not everyone can do it, and not a lot of people who start a blog even want to do it after they realize how much work it takes! Jess explains these and more details in length in her post, and it is definitely worth the read. Up to 50% off Jeans, Pants, Sweaters & Outerwear at Old Navy! This gorgeous cable knit sweater is 40% off and comes in 6 colors! My pink ruffle sleeved sweater is 48% off! That Rose Gold Swan Floatie you wanted during the summer is now on sale for $30! These Steve Madden suede thigh high boots are 20% off! This fun pom pom tote is 50% off! Hope you enjoyed the post! What are a few things that you're loving? P.S. Here are a few other things to check out from the blog if you missed them! In need of the perfect gift? Check out my Gift Guide For Her. Shopping the Sephora VIB sale? I've gathered ALL the best products to buy HERE! New Orleans on your travel bucket list? Be sure to read my NOLA city guide before you go! The colors in that eyeshadow palette are very soft and pretty! Those are the sort of shades I like, as I don't tend to go too dramatic with my eye makeup. Yes, aren't they just gorgeous? None are way too out there that I wouldn't actually wear them in an everyday look! So worth the purchase! I love those posts from your blog, Erica! I used to do them a lot when I first started, although definitely with much less "effort" for lack of a better word, lol. But I really want to start doing these on a more regular basis! And yes girl go listen to it, SO GOOD! It's such a beautiful palette, definitely one of my faves! I wanted that toasted palette so bad, but have so many things like it that I couldn't do it ! Tarte is just the best! I love all of these other items! It's such a gorgeous palette, but totally understandable not to buy when you have similar items! Maybe just wait until those run out...haha! Thank you! And yes aren't holiday candles the best? I can't wait to shop for the Christmas-y ones! It's SO worth it!! If you get it let me know how you like it! I want that tartelette palette! The colors are soo pretty! That tarte palette is sooooo pretty but I'm afraid it won't show up on my skintone. I love the look of their products but only own a bronzer from them. I really want to try their blushers. A good scented candle is the best! I believe on the website they have them swatched on a variety of skin tones (but don't quote me on that!). I just recently got a bronzer and blush from them, but have yet to try it out! And yes! Scented candles are the best! I want that tarte palette so bad! Also, my hubby and I love that candle. It smells amazing. It's so worth the buy!! The shades are so pretty! And isn't the smell amazing? It always makes me want to start baking, haha! I just got the Toasted palette in too and I LOVE IT!!! It's soo good, hands down my favorite palette I own! I'm loving reputation too - I've had it on repeat! Isn't it though? SO many great shades! And yes to reputation! What's your favorite song from the album? omg obsessed with that Tarte pallet! its gorgeous. The eyeshadows are sooo pretty! So is the duvet cover....not sure how nice it would stay with my pup! Haha, I know what you mean! I've got a young cat and dog at my place, so we'll see how it goes! I've pretty much decided I need all of Tarte's palettes haha. And love that duvet cover! Lol, right?! They have so many great ones! And thank you! 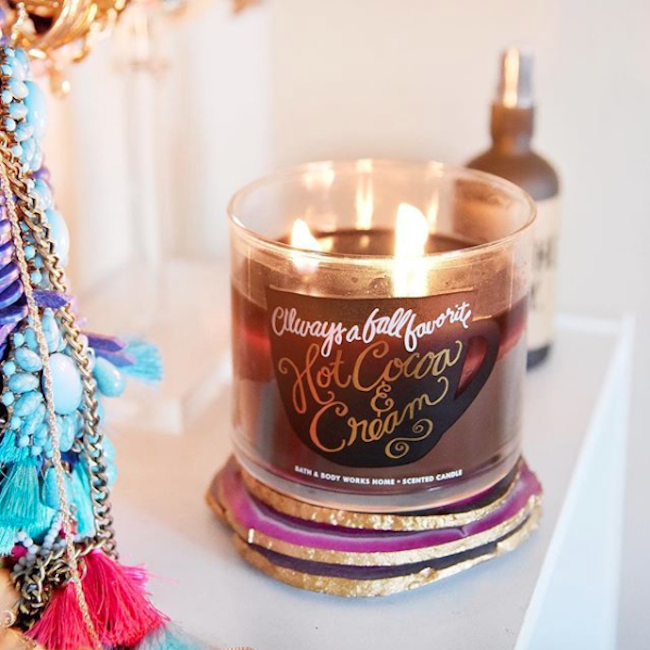 That hot cocoa candle and duvet sound heavenly! Love your picks! I think everyone deserves that cocoa candle! Thank you! I am lusting over that duvet cover... my boyfriend is adamant that we can't have TOO girly of a duvet in our bedroom... but how girly are ruffles? I love that makeup palette! It's so pretty! I really need those sheets in my place! So cute! It's one of my favorite palettes, there are just so many great shades! They seriously are! I can't wait to browse their Christmas themed ones! Mmmm that candle looks like a must! I have to add it to my Xmas list. It's seriously the best! You won't regret it! That eyeshadow palette is the prettiest! That shadow palette looks perfect for smokey holiday eyes! I like posts like these, too! I like learning a little more about everyone by seeing what kinds of things they get into each week. We do our weekly Obsessions and I like that we can share little snippets from our week without having to devote a whole long post about it. Feels authentic! Loving that eye shadow palette too! I'm so excited to read that article about life as a blogger, I've had a few blogger friends recommend it to me! i do love taylors album and that tarte palette!!! I've been obsessed without that Tartelette palette too! So many great shades!